Sam Wildow | Miami Valley Today Covington students Taylor Roth (left) and Lillian Hughes (right) demonstrating a helicopter drop and rescue LEGO robot on Thursday. Sam Wildow | Miami Valley Today Covington students Shelby Petry (front) and Emma Wilson demonstrating a LEGO robot pulling a tissue box on Thursday. Sam Wildow | Miami Valley Today Covington students Kaden Hughes (left) and Lane Jay (right) demonstrating a frog LEGO robot on Thursday. Sam Wildow | Miami Valley Today Covington science teacher Kim Dunn’s eighth grade class watching a race car LEGO robot work using motion sensors on Thursday. COVINGTON — Covington science teacher Kim Dunn, who teaches grades seventh and eighth grade students, is utilizing new LEGO robotics equipment this year to teach students critical thinking skills, as well as to introduce a programming element to her science classes. Dunn came across the LEGO robotic kits during a teacher in-service day when they were learning about different technology available to classrooms, and she said those LEGO robotic kits were the first thing that caught her eye. “It was neat,” Dunn said. Dunn’s classroom was able to receive donations from the Covington Community Chest and the Covington Noon Optimist Club to purchase 10 kits for approximately $2,000. Dunn credited Chris Haines, president and CEO of Marias Technology, with helping her apply for and receive funding for those kits. Dunn said that she utilizes the kits for a three-week section every nine weeks. The kits allow the students to build small LEGO robotics of their own inventions that run off Bluetooth to connect to their Chromebooks. The students also learn how to use the program with the LEGO robotics in order to give the robots different commands. “It challenges them to think critically,” Dunn said. She added that the LEGO robots also incorporated a new technology component to her classroom. On Thursday, one of Dunn’s eighth grade science classes presented on the different LEGO robots they put together and programmed. “There’s seven different science topics,” Dunn said. The students were tasked with integrating another science topic into their robot, and they came up with a miniature helicopter, floodgate, earthquake tester, and more. Students Shelby Petry and Emma Wilson demonstrated a robot with pulling capabilities, demonstrating on their robot pulling a tissue box across their table and how they added other parts to reduce friction. Student Taylor Roth presented on her group’s helicopter project, which had two moving parts. Roth showed how their robot had spinning helicopter blades and a pulley system with a magnet at the end to illustrate a drop and rescue. Students Kaden Hughes and Lane Jay discussed their frog robot, which demonstrated changes between a tadpole and a frog. Other LEGO robots included an earthquake tester that tested different blocks abilities to withstand shaking, a race car with motion sensors, a dump trunk, and a floodgate. 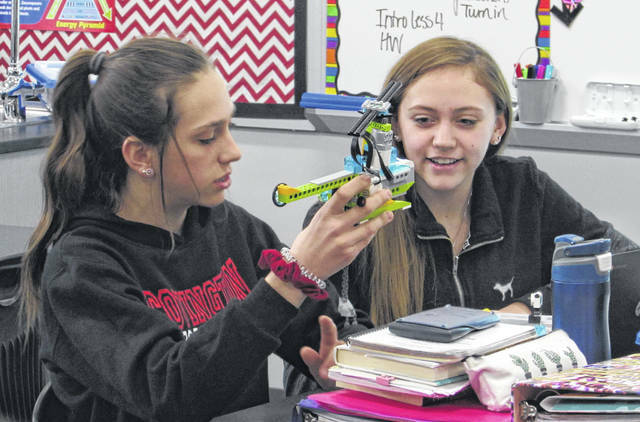 https://www.dailycall.com/wp-content/uploads/sites/30/2019/04/web1_Helicopter-rescue-1.jpgSam Wildow | Miami Valley Today Covington students Taylor Roth (left) and Lillian Hughes (right) demonstrating a helicopter drop and rescue LEGO robot on Thursday. 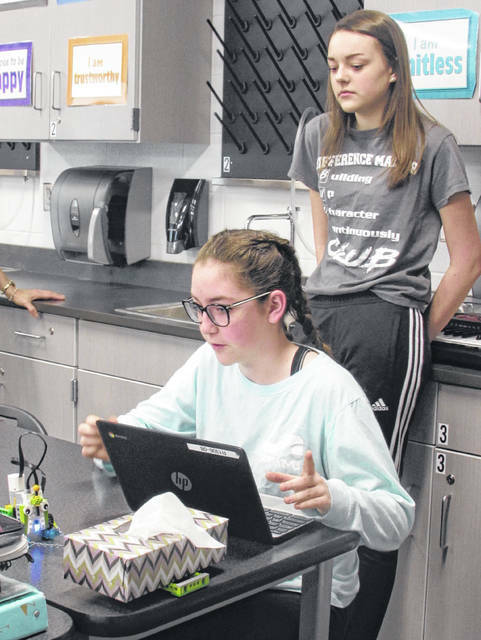 https://www.dailycall.com/wp-content/uploads/sites/30/2019/04/web1_Lego-pulling-robot.jpgSam Wildow | Miami Valley Today Covington students Shelby Petry (front) and Emma Wilson demonstrating a LEGO robot pulling a tissue box on Thursday. 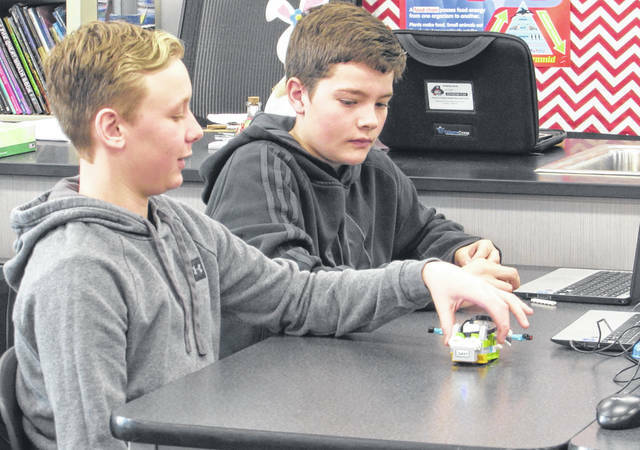 https://www.dailycall.com/wp-content/uploads/sites/30/2019/04/web1_frog-lego-1.jpgSam Wildow | Miami Valley Today Covington students Kaden Hughes (left) and Lane Jay (right) demonstrating a frog LEGO robot on Thursday. 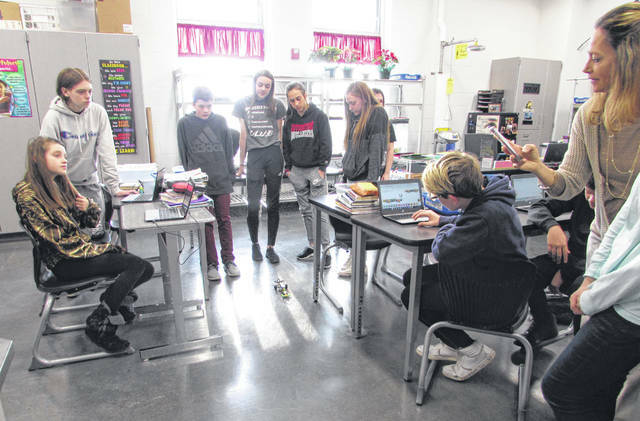 https://www.dailycall.com/wp-content/uploads/sites/30/2019/04/web1_lego-robotics-full-class-.jpgSam Wildow | Miami Valley Today Covington science teacher Kim Dunn’s eighth grade class watching a race car LEGO robot work using motion sensors on Thursday.